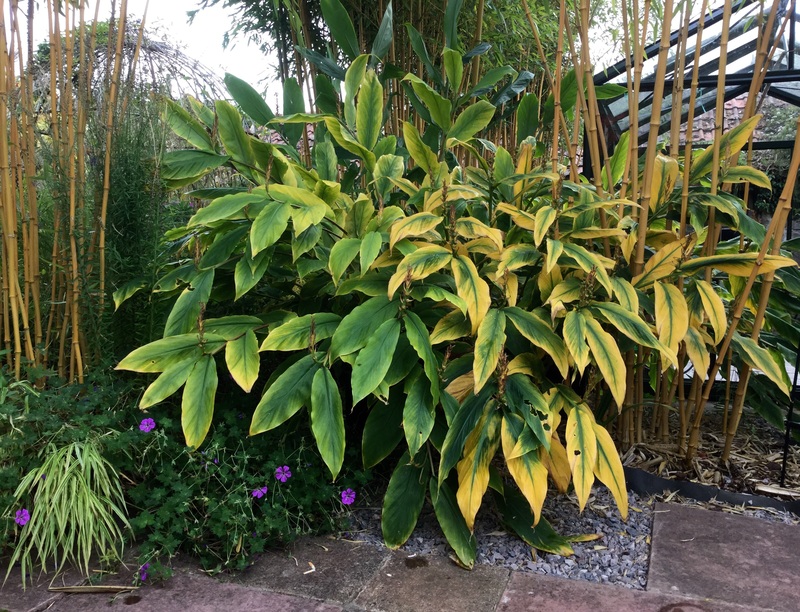 A couple of weeks ago, a Bristol based researcher for BBC Gardeners’ World was looking to fill a last slot in their schedule for a short autumn feature to be shown in 2016. Rob came across Barn House garden on the NGS website, the brief was late season colour and, if filming went ahead, it would be at short notice. A day or two later he visited to see the garden and interview us, which was a pleasure as he was so charming and knowledgeable. Much to our delight Rob called the following week to confirm a date. Fortunately, there wasn’t time to panic about whether the garden was up to scratch, instead we focused on the autumn work as planned. Settling nursery plants in for winter is a priority, new stock like the sesleria plugs are top of the list as we plan to divide them next year. Last Friday morning, the friendly and enthusiastic crew arrived bang on time and quickly set to work assembling their kit : everything was compact and portable, powered by battery packs and free from lengths of trailing cables. Patty, the director and producer, was a marvel, and soon put us at ease. She did a quick walk through the garden with Rob logging the sequence of what they’d use to tell the story she had in mind, it must be like doing a three dimensional jigsaw puzzle. One of the extra items that caught her keen eye was dazzling Pennisetum macrourum. Once we were miked up, footage for the short introductory interview was filmed with us seated at the little white metal bistro table, in the blink of an eye this had been cleverly repositioned in front of the rugby scrum of fading ginger lilies. As predicted, Patty spent an hour teasing material from us between pauses for extraneous background noise to subside – even a distantly passing plane was enough to mar Gary’s soundtrack, let alone the churning of a neighbour’s cement mixer. She patiently prompted the narrative with questions, some were quite tricky. 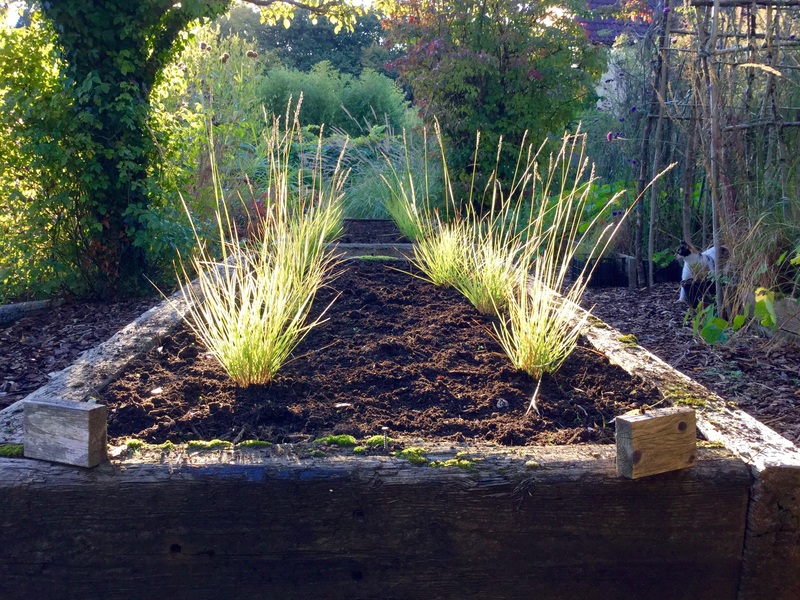 The potential nuisance value of self seeding grasses always makes me smile : much of the garden, especially the little meadow, has been raised from seed, and, if not seed, then by division, all thanks to plants with generous natures. When done, we gladly handed the garden over for the rest of the morning, rushed indoors to put the heating on and made hand warming hot drinks for everyone. 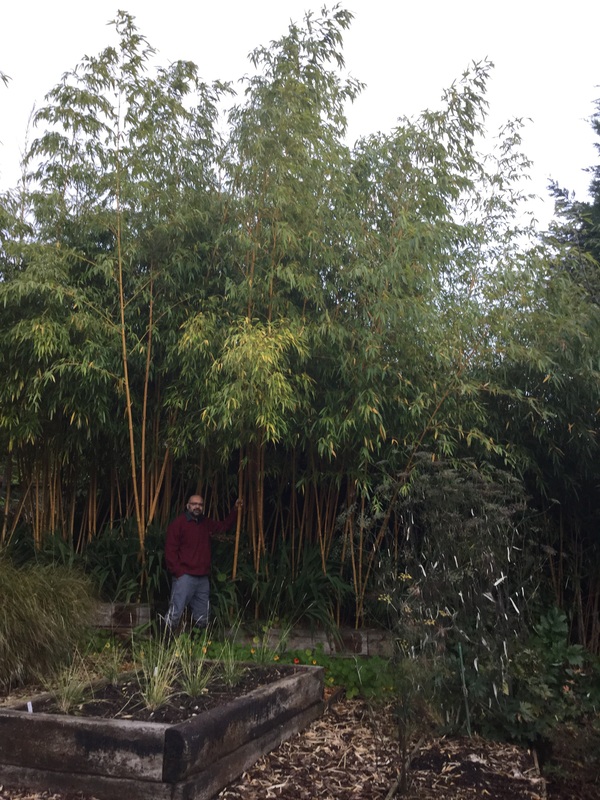 Having defrosted, there were a few walk though shots plus short pieces on specific grasses to stumble through, I’m proud to say Hitesh rattled off his spiel about the bamboo with his usual aplomb in only two takes, after all, these 24′ tall monsters are his pride and joy. Over a quick soup lunch, we enjoyed hearing tales of places they’ve seen and people they’ve met, including the legendary Geoff Hamilton, Patty recalls him fondly as she was working with him the week prior to his tragic death from a heart attack in 1996. 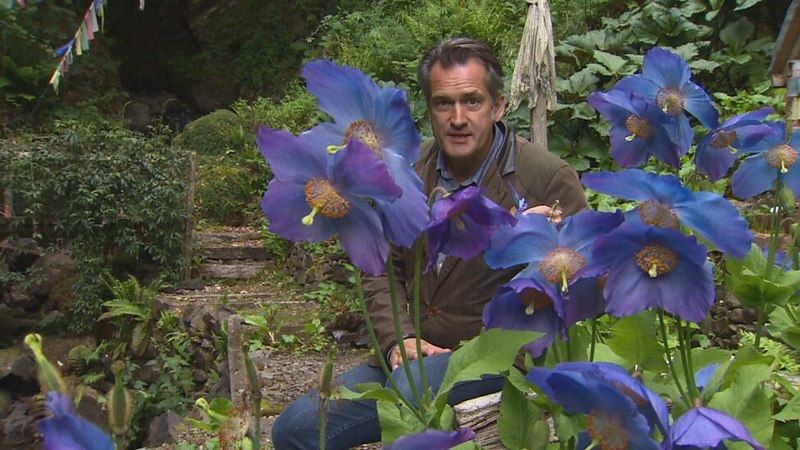 Rob was involved in the fliming of Craigieburn garden and nursery with its fabulous collection of Himalayan flora including the most breathtaking display of Meconopsis poppies. A clip from this episode of Gardeners’ World, July 2015 is available here on iPlayer. Listening to their wonderful stories brought home our good fortune : we’d never have imagined that our garden would be filmed by the BBC for a programme we’ve been glued to for decades. Towards the end of the afternoon a long arm boom was called for, we held our breath as we watched Robin deftly manoeuvre a counter-weighted camera that swooped like a Valkyrie first above the grasses terrace, and then, the meadow. This delicate work was time consuming, the concentration required almost palpable, yet, thrilling to watch. It was the perfect end to a very special day. The next day we took the dogs out for an early morning romp through their favourite patch of sniff-rich woodland as a reward for having been so well behaved, then treated ourselves to a delicious brunch. As we clinked a glass of fizz, the toast had to be ‘The NGS’, thanks to their publicity we enjoy a bonus of an undreamed of page to add to the garden scrapbook. Yes, exciting, although not to be aired until next autumn it was just the right time to jostle us from the fatigue that sets in as autumn progresses. Will let you know! So that’s how they do those aerial shots. I can’t wait to see this one on the screen. As Chloris says, don’t forget to tell us when it’s on! I shall let you know when it’s on. We really enjoyed watching the small team and appreciate just how much goes into what in the end will only be a few minutes of film. Hi Kate – How exciting. We in NZ are 2/3 years behind with this great programme! I have blue poppy envy! Always love the photos of them and covert them maddly! Not cold enough here tho!. I do have some soldier red poppies out tho’! Not very happy as can’t see any opium poppies coming up. I chucked my remaining seed ona bank that I have been trying to convert from concrete clay and spreading thinly grass clippings and coffee grounds. Yes I have now got soil but buried my seeds. I have had over 50 years so will have to make sure get more seeds from my daughters. Boo Hoo! We thought Craigieburn garden was a real highlight this year, I have blue poppy envy too. I enjoy trying to trick opium poppies into growing where I want them too. Maybe it’s too late to rake the bed over to expose the seed. How exciting! It will be wonderful to see your garden next year, you must remind us all. We appeared on Carol Klein’s programme, Open Gardens, a few years ago, it certainly was an experience! Wow, that must have been an amazing experience – it was an eye opening programme to watch. Open Gardens was inspiring, it was interesting to see that NGS garden owners are subject to critical scrutiny. Now we are getting to know how it feels! Hey, that’s so exciting! I’m looking forward to seeing it too! Thanks, Janna, you’re very kind. How exciting and yes please let us know when it will be broadcast. That must have been an interesting experience, seeing all the takes, equipment and work behind the shots for the piece. I’ll definitely watch out for your announcement about it’s screening. Yes, it was fascinating – so much goes on before and after too. So many hours for just a snippet! Thank you sharing this experience with us – so fascinating to get more of an idea how it all actually happens and you must both have been thrilled to have been part of it, even if you were put on the spot with some of the questions! You must be quietly chuffed to have been picked out from the NGS to take part, I am sure – and we are looking forward to next autumn! ps have you received the article on persicarias I sent? You’re right, it was a thrilling day, fun too. Thank you so much, Cathy, RHS periscaria article is brilliant, so many to collect and lovely combinations. Nice surprise to see it’s written by Paul McBride of fab Sussex Prairies, he’s done a great PR job on this underrated family of plants. Glad you enjoyed the article – and I have since sourced Blackfield and a couple of others I liked. Ooo … Blackfield is on my wish list too. That’s a very kind offer, I still have your pink persicaria to send …. Congratulations Kate, both on publicising the NGS and being filmed for Gardeners World. I look forward to seeing it next autumn. Thank you Brian, we’ve had such a lot of fun opening the garden to raise money for the NGS. Publicity is always helpful especially when you live off the beaten track. I’m following and enjoying your posts, by the way, I will figure out how to successfully register a comment soon. Blogger sites often defeat me! A few wordpress bloggers mention having problems commenting on blogger. I have a wordpress and google account which works well automatically selecting the correct one for each site. How exciting, I can’t wait to see it broadcast next Autumn. I’m an avid watcher of Gardener’s World and am particularly enjoying the honesty of the programme lately. Gardening is not always a bed of roses. I agree, it’s refreshing to see thornier problems addressed, even more time on them would be welcome. Judging by Anne Wareham’s wise and witty ‘Outwitting Squirrels : And Other Garden Pests’ we each have our own tales of woe – always makes me feel better to know I’m not the only one with a problem in the garden. How very exciting and from the short time I have followed your blog I understand why they would have chosen your garden. Remember to tell us when it is to be shown.well done! That is such a lovely thing to say, thank you! Opening the garden for the NGS has opened so many doors, it’s been an amazing experience. How nice to hear from you, you’ve had such a busy and fun filled year I’m not surprised you’ve missed GW. No doubt time will fly! Yes, it was. A dream come true.